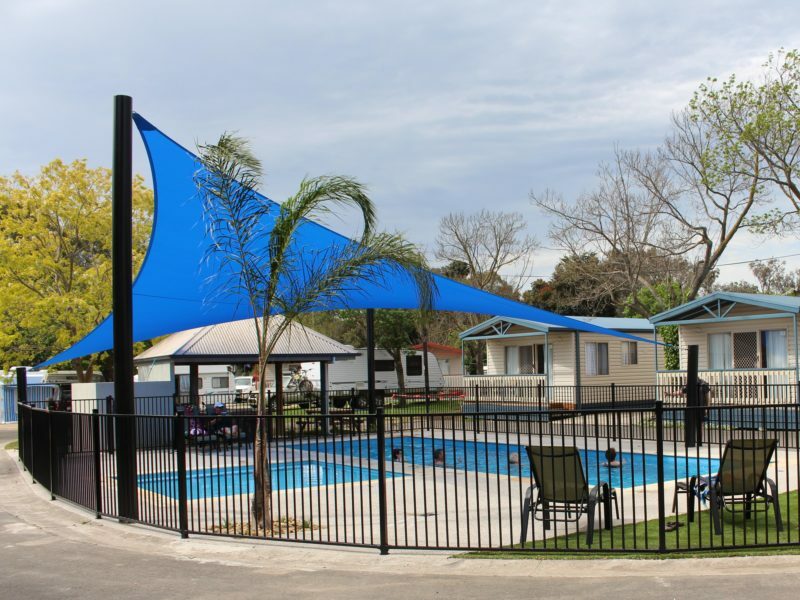 Barwon River Holiday Park is conveniently located only two kilometres from Geelong CBD and waterfront Geelong, nestled on the banks of the Barwon River. Enjoy the relaxing atmosphere, beautiful natural attractions and wildlife on offer. The parks quality shines through from the moment you arrive. Clean, updated amenities including a family bathroom with low mobility facilities. 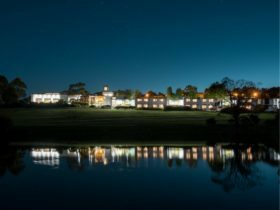 A great range of accommodation options to suit families and couples. Accommodation options range from superior deluxe cabins through to budget cabins, ensuite sites, lush green shady, powered caravan and tent sites. Group bookings available. 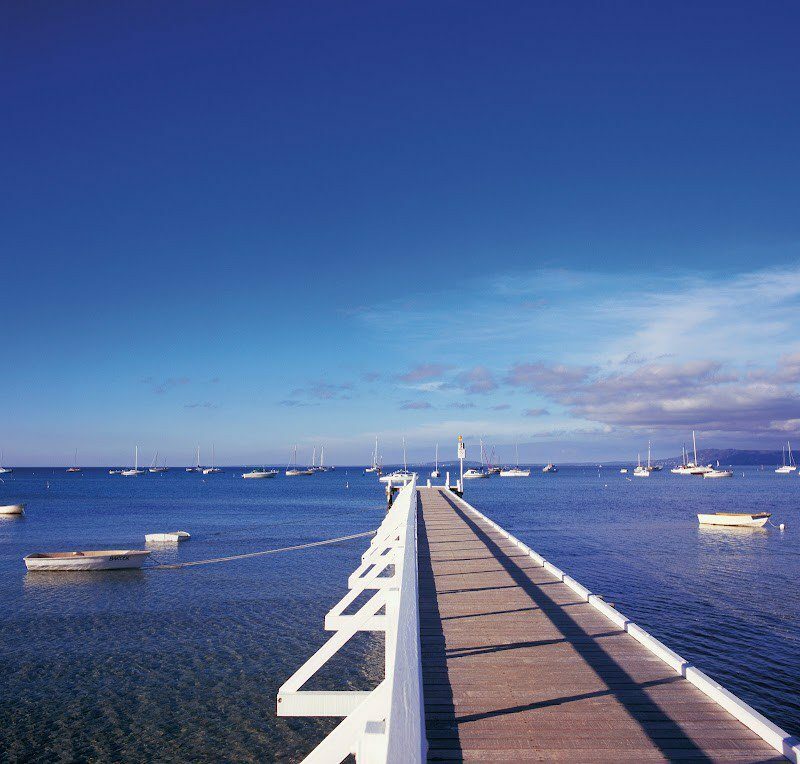 Barwon River Holiday Park is the perfect base from which to explore Geelong and its surrounds, including the Great Ocean Road. 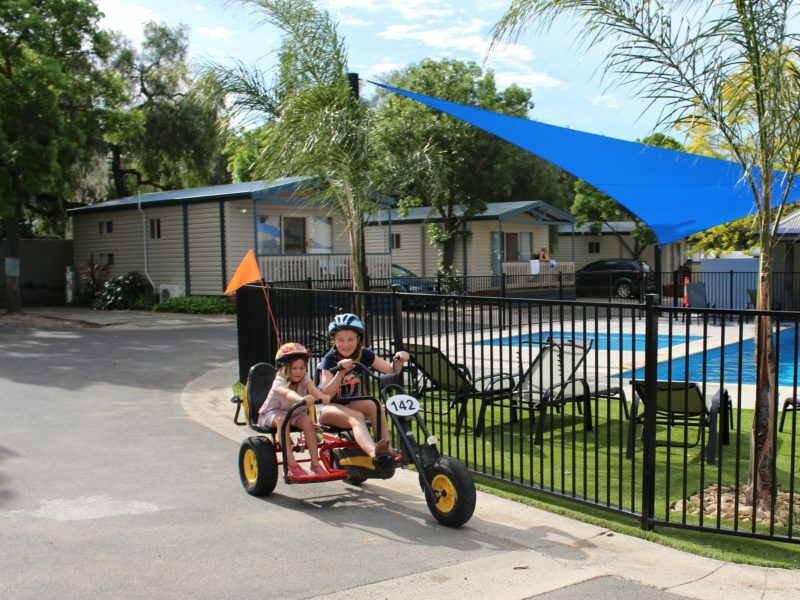 Park features an outdoor heated swimming pool, kiosk, children’s playgrounds, jumping pillow, pedal go karts, camp kitchen, internet kiosk and wireless Internet, covered barbecue areas, EFTPOS facilities and laundry. 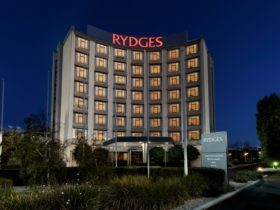 Walking distance to nearby shops, supermarket, banks, restaurants, bars, cafes, Simonds Stadium and beautiful parklands. 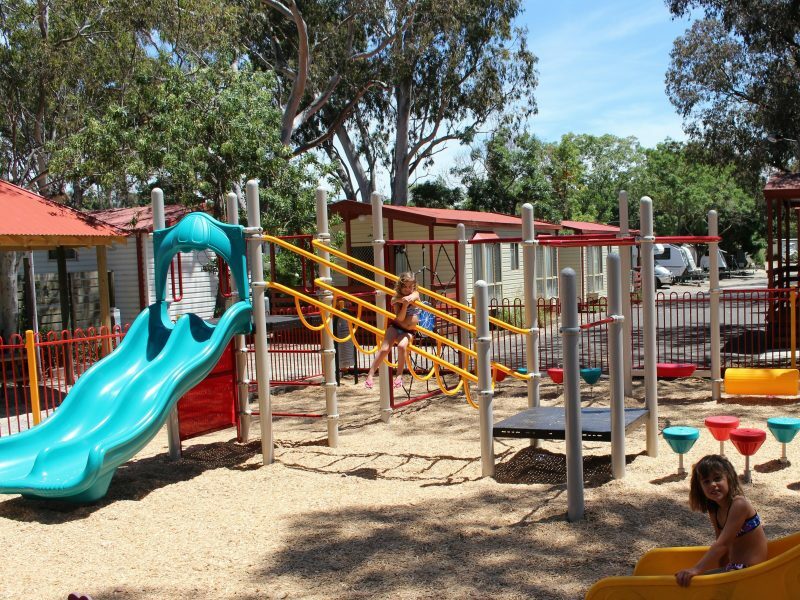 Look no further if you are looking for a quiet, family friendly, conveniently located tourist park on the banks of the Barwon River, then this is the park that you have been looking for. The Superior Deluxe Cabins and Pool View Deluxe cabins are the most spacious cabins and also have a small balcony. They are a self contained cabin and have a bathroom ensuite, kitchen with cooking facilities, lounge area with television and DVD player, heating and air-conditioning. Both of these cabin types have queen bed in the main bedroom and the second bedroom with two single bunks – sleeping up to six persons. There is a fantastic range of other cabins that also differ in size and bedding arrangements and are available starting from budget, right through to superior deluxe, powered caravan and camp sites. New, modern, self-contained two bedroom cabin. The main bedroom has a queen bed. 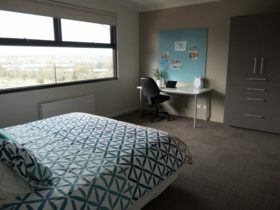 The second bedroom has one bunk (two singles) and a single bed, this bedroom can accommodate a port a cot if required. Ensuite bathroom, kitchen with cooking facilities and lounge/dining area with television / DVD, heating and air conditioning. This cabin is located opposite our outdoor swimming pool. Spacious self contained two bedroom cabin. 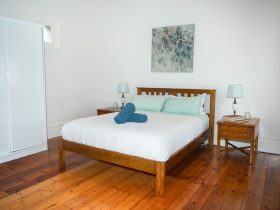 The main bedroom has a queen bed and the second bedroom has a bunk – which is a double bed and a single over the top. 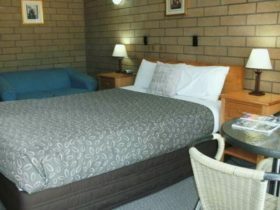 Bathroom ensuite, kitchen with cooking facilities, lounge with television / DVD, heating & air conditioning. Accommodates a maximum of five persons. Bedding/linen is included. Self-contained two bedroom cabin with a double bed in the main bedroom and the second bedroom (also passage from lounge/kitchen area through to bathroom ensuite) has a triple bunk (three singles). Kitchen with cooking facilities, bathroom, ensuite, lounge with television / DVD, heating & air conditioning. Spacious drive-through ensuite sites containing your own private shower, hand basin and toilet facilities. 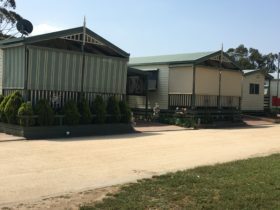 Powered caravan and camp sites, situated in pleasant and spacious surrounds.